Tom Goldman Tom Goldman is NPR's sports correspondent. His reports can be heard throughout NPR's news programming, including Morning Edition and All Things Considered, and NPR.org. April 20, 2019  NPR's Scott Simon talks to sports reporter Tom Goldman about the injury affecting one of the WNBA's best players. Plus, they discuss a new initiative aimed at making racing less deadly for horses. April 15, 2019  Tiger Woods won his fifth Masters title on Sunday, marking an incredible comeback from injury and personal hardship that ended a nearly 11-year championship drought. April 14, 2019  In a surprise comeback, Tiger Woods wins his first major title in more than a decade. 23 Thoroughbred Deaths Force Santa Anita To Change. Will The Racing Industry Follow? April 10, 2019  The fatalities have forced the horse racing industry, and the public, to take a hard look at the sport and some of the issues that have been debated for years. 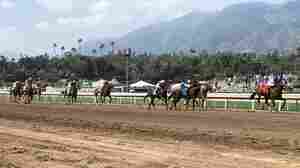 April 9, 2019  The famed Santa Anita racetrack in Southern California is under scrutiny after a spike in thoroughbred deaths. Santa Anita hosted its biggest race day of the year this past weekend. April 5, 2019  Texas Tech and Auburn are first-timers to the NCAA Division 1 Men's Basketball Final Four. They're part of a recent trend toward parity and even better play in the later stages of the tournament. March 30, 2019  We look at the season openings of Major League Baseball, the NCAA tournaments and all the latest sports news. America's Favorite Pastime Is Back — And Some Wish It Would Just Hurry Up! March 27, 2019  As baseball tries to appeal to a younger audience, there's concern the long game times may drive away that demographic. 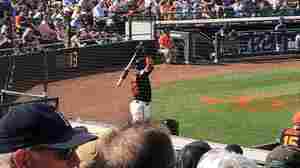 So MLB is experimenting with speeding games up and eliminating downtime. March 26, 2019  Portland, Ore., has a history of embracing protest. But since Trump was elected, civil protest has often boiled over into civil unrest — a problem that's challenging the city's mayor and residents. March 21, 2019  The top men's college basketball teams on Thursday start their journey to the annual championship. The women begin Friday. Get ready for exciting stories to play out over the next few weeks. March 16, 2019  We have a recap of the week in sports. March 2, 2019  NPR's Tom Goldman discusses the sports stories that grabbed his attention this week - including the SheBelieves Cup. February 16, 2019  Colin Kaepernick has reached a settlement with the NFL after alleging collusion to deprive him employment. Meanwhile, the league is keeping Kareem Hunt in its ranks. February 15, 2019  Former 49ers quarterback Colin Kaepernick says he 'resolved' his grievances with the NFL. In 2016, he became the face of a protest movement in the NFL against racial injustice and police brutality. February 2, 2019  Sunday's Super Bowl pits the New England Patriots against the Los Angeles Rams. LA's talent-packed offense gives New England's head coach Bill Belichick a tough choice on who to target.